This discography is a comprehensive listing of official releases by British soul singer Beverley Knight. It consists of seven studio albums, four compilation albums (two greatest hits albums and two remix albums) and one EP. Knight has also released twenty-eight solo singles (excluding re-releases) and twenty-six solo music videos. She has also collaborated on at least fifteen other projects. MOBO Allstars 1998 "Ain't No Stopping Us Now" Charity single released collectively by MOBO Award nominees in 1998, reaching No. 47 in the UK singles chart. Other artists include Mica Paris, The Honeyz and Another Level. & Beverley Knight 2000 "Hard Times" The album track features vocals from Knight and music by Pine. Taken from the album Back in the Day. featuring Beverley Knight 2001 "Main Vein" Album track taken from the album A Funk Odyssey. featuring Beverley Knight "Love Foolosophy" Knight provides backing vocals on this album track taken from A Funk Odyssey. & Beverley Knight 2002 "A Change Is Gonna Come" A cover of the Sam Cooke classic, the song features vocals from Knight and music from Jools Holland's Rhythm and Blues Orchestra. Taken from the album Small World Big Band Volume II. & Beverley Knight "Maybe Love" A duet with the French singer, taken from the soundtrack to Mon Idole. & Beverley Knight "First Time For You" A duet with the French singer, taken from the soundtrack to Mon Idole. Beverley Knight 2003 "Love's in Need of Love Today" A cover of the Stevie Wonder classic, included on the Warchild charity album. Hope. Band Aid 20 2004 "Do They Know It's Christmas?" Charity single speerheaded by Sir Bob Geldof and which became global smash and hit No. 1 in Britain. Other artists included Dido, Robbie Williams, Joss Stone and Sir Paul McCartney. Roni Size featuring Beverley Knight & Dynamite MC 2005 "No More" The song had a strong anti-gun message and featured on the album Return To V. Reached No. 26 on the British charts. & Beverley Knight "Where in the World" An original song composed by Jools and Beverley for his 2005 album Swinging the Blues, Dancing the Ska with his Rhythm & Blues Orchestra. & Beverly Knight 2006 "Sometimes" Taken from the album Overdrive, this limited edition single was released as a 12" Vinyl only. featuring Beverley Knight 2008 "Running Free" Taken from the album Running Free, this was released as the third single from Ali Campbell's album of the same name as a download only single on 31 March 2008.
featuring Beverley Knight 2012 "Only One" Taken from the album The Life and Soul, this was released as the second single from Mamas Gun's second studio album as a download only single on 8 January 2012. The Justice Collective "He Ain't Heavy, He's My Brother" Charity single in aid of the various charities associated with the Hillsborough disaster. The song, a cover of The Hollies single, became the Christmas No. 1 single in UK. Other artists included Paloma Faith, Robbie Williams, Rebecca Ferguson, Eliza Doolittle and Sir Paul McCartney. "Come As You Are" 2004 J.T. "Keep This Fire Burning" J.T. 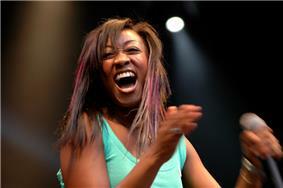 "The Queen of Starting Over"
^ a b "Beverley Knight UK discography". chartstats.com. Retrieved 26 October 2009. ^ a b c d e "BPI – Certified Awards Search". ^ a b "Beyoncé remains at top of album charts with narrow lead over Adele". "Flavour of the Old School"
"Moving on Up (On the Right Side)"
"Not Too Late for Love"